It is so important to provide both good reading material and the example of the Saints in the formation of our children. Teenagers especially need to see and learn from true heroes! The third and fourth volumes of this series offer four stories written with middle grade children in mind. The stories are longer (20 - 25 pages each) than those in the first two volumes and contain issues that children at this age are beginning to think about, for example: pro-life and the married state (St. Gianna), pursuing further studies and discerning a vocation to the religious life (St. Edith Stein), sacrificial love and perseverance (St. Junipero Serra), and God's call to share the gift of Faith with others (Bl. Francis Seelos). 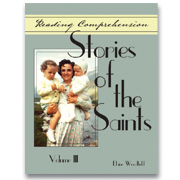 Each of the Stories of the Saints is followed by four pages of "Lesson Activities," including: "Vocabulary," "Terms to Know," "Comprehension Questions," "Analyze This," "Essay Questions," "Quotations," "Geography and History," "Research and Report," "You, the Biographer," and "Putting Your Faith into Practice." Includes answer key. Many illustrations and photos. Softcover. 8½"x11" 109 pages.